Slicetige Lite is a free and cross-platform Facebook timeline image creator, which can be used in order to easily edit and arrange images used in the famous Facebook timeline, this goes for both the background image, the so called cover image and the smaller image in the lower left corner when you’re looking at the timeline, which is called avatar. Timeline has been introduced into Facebook in the late 2011, which changed the way that our profile information can be seen, and it also gave users new and interesting ways of how they can decorate their profiles. Those who have been trying to create timeline templates which look nice and are in sync have probably discovered that doing something like this isn’t very easy, to get the images to fit just right, this is where Slicetige Lite can help you out, it will automatically slice the image, so that you see everything displayed properly when you upload them on your timeline. Similar software: 5 Free Software to Create Timeline Covers, CoverCanvas. Notice how the cover background seems to just be an extension of the avatar, you can do the same thing with your own images with the help of of Slicetige Lite. The thing that Slicetige does is that it allows you to easilly cut photos and images so that you have in the size required for them to fit snugly on the timeline without there being any kind of cropping on the part of Facebook, which could perhaps cut out something important, ruining the overall design of the timeline. Use Ctrl + mouse dragging in order to center images in their place. Once that you export images with the File >> Export option, they will be saved and cut and then you just need to upload the image to Facebook where it can start decorating your timeline. 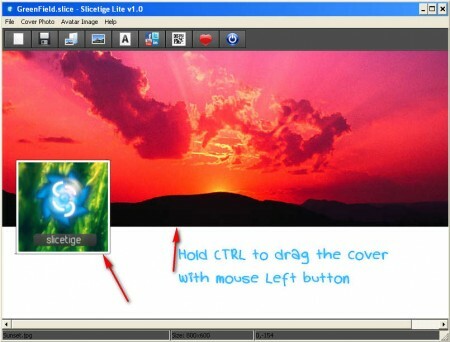 With the advanced features which you can open up by giving a small donation, you get even more tools which convert Slicetige into a serious image editor, which has layers, text editing, QR code generation and more, but make sure to try the Slicetige Lite version first, it’s free.